Along with Ziggy Marley, Violent Femmes, Grace Potter, Blues Traveler, Steel Pulse, Bruce Hornsby, Chevy Metal, Everclear, Sugar Ray, Donavon Frankenreiter, and More!! “We’ve painstakingly curated this lineup to capture what we believe is the unique spirit ofBeachLife, bringing together a mix of legendary icons, headlining touring bands and emerging artists who all in some way represent our Southern California beach lifestyle,” says Allen Sanford and Rob Lissner, co-founders of The BeachLife Festival and LiveList, a Venice-based tech platform that streams live music performances around the world. While music takes center stage at The BeachLife Festival, top SoCal chefs will also have a stage of their own. ‘Side Stage,’ a 50-seat, sit-down, pop-up restaurant, will give festival-goers access to an unprecedented upscale dining experience just feet from the main stage. Beyond Side Stage will feature a curated wine village with boutique wineries, a massive craft beer bar focused on LA breweries, a VIP poolside experience, an elite speakeasy, and multiple bars and food vendors and trucks across the venue. Band-inspired menus will be created by handpicked chefs such as esteemed California-based chef and restaurateur, David LeFevre. Additional chefs will be announced soon. A limited number of reservations will be available for $150 per person beginning March 1. More information, menu options, and details regarding reservations will soon be released via beachlifefestival.com. 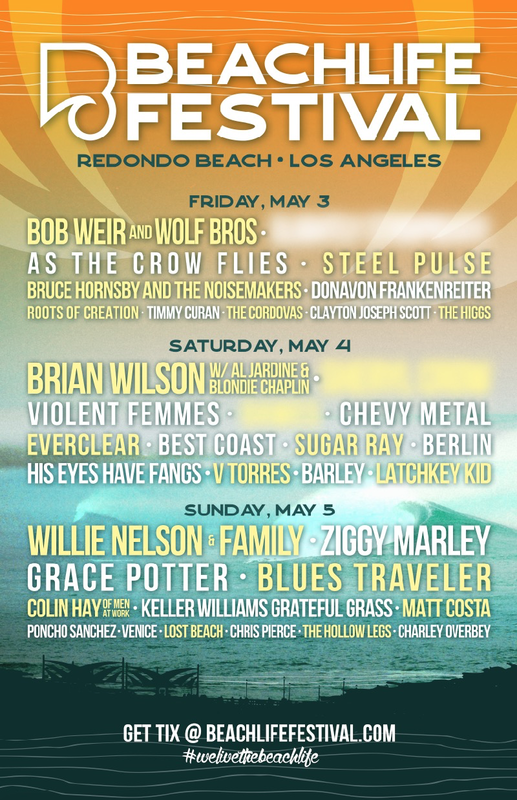 Designed to embrace SoCal’s coastal essence where live music is synonymous with sand in your toes and a cold drink in hand, The BeachLife Festival will feature California culinary stars and multiple surf and skateboarding components in addition to the 40 musical acts. The BeachLife Festival will also take a “content-first” approach by creating a highly-integrated level of engagement between artists and guests - even before announced musical acts take the stage. In the months leading up to the festival, confirmed BeachLifeacts will be producing exclusive content to highlight their connection to, and passion for, California’s acclaimed beach culture. Copyright © 2019 Mason Jar Media, All rights reserved.